The 100th anniversary of World War I is being marked by the planting of woods across the UK under the banner 'We Will Stand For Those Who Fell'; the trees' annual cycles of regeneration and recovery a metaphor for mourning, memorial and moving on. But throughout history wood has been one of the central commodities required for the machinery of war and World War 1 was no different. Historian James Taylor from the Imperial War Museum shows Samira some of the wooden artefacts which tell a story of wood's darker destructive side. 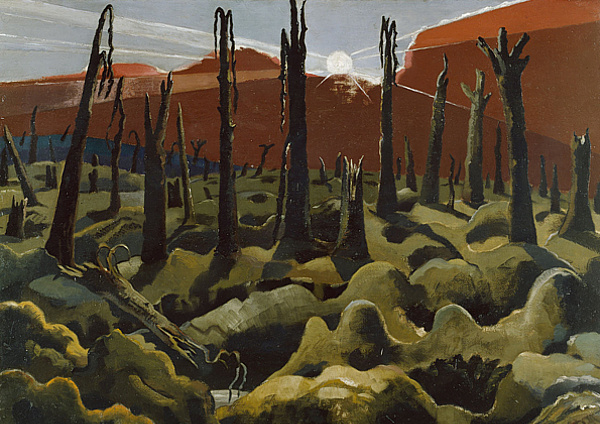 For many though, the paintings of Paul Nash, with their scenes of smashed solitary tree stumps standing in empty battlefields are a multi-layered evocation of that war's futility, horror and waste. Samira takes a look at Paul Nash's 1918 painting 'We Are Making A New World' and talks to the artist, writer and Nash expert Paul Gough about this and other iconic Nash images and whether they have new messages for us today. They'll be joined by forest scientist Gabriel Hemery of the New Sylva Foundation to talk about the links between war and forest stock over time and Northern Irish artist Gail Ritchie whose current work explores some of Nash's themes in visual representations of present day conflicts and loss.